Hi crafters! Today I am happy to be a Growing in Unity Girl for 2017 and welcome to Day 1!.. This event lasts for 5-days and be sure to comment each day because at the end of the week I will pick two lucky winners who will get 25 random Unity stamps. So de sure to leave some love from all the GIU gals participating this week! 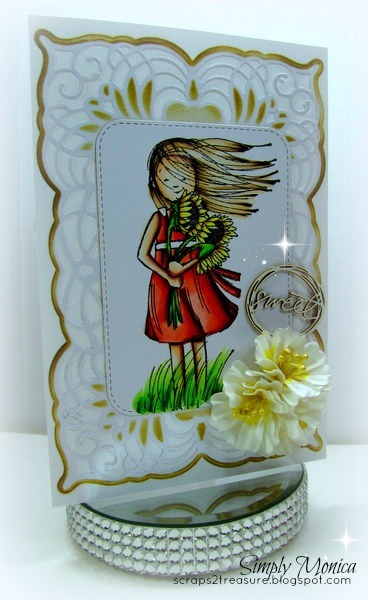 For my first day I created this card using "Face the Sunshine" stamps. I colored her using copics and used my Spellbinder dies for the backdrop of the card. Then I used my distress inks in Tea Dye to give it some color and of course I had to add some flowers. Hi fellow GIU girl! This little girl is SO sweet and you have coloured her beautifully! I love the way you have framed her with the die! I love this Unity stamp! Thanks for sharing. I love this stamp! I use her all the time. Your coloring is magnificent! Very nice card! The coloring, background, position etc., all fits in so well. I love the style. Thank you for sharing and I'm looking forward to tomorrow's creation. Love this stamp, wish I colored her as well as you. Can't wait to see tomorrow's creation. What pretty card! Love your coloring and the die cut you used! Love that sweet image you used and your pretty coloring! Beautiful card! The die is lovely to frame this pretty card! Looking forward to more of your creations this week! I am a follower already, so I know I won't miss the posts! Beautiful card you coloured her really well. Beautiful Monica!!!! Love the layout!! 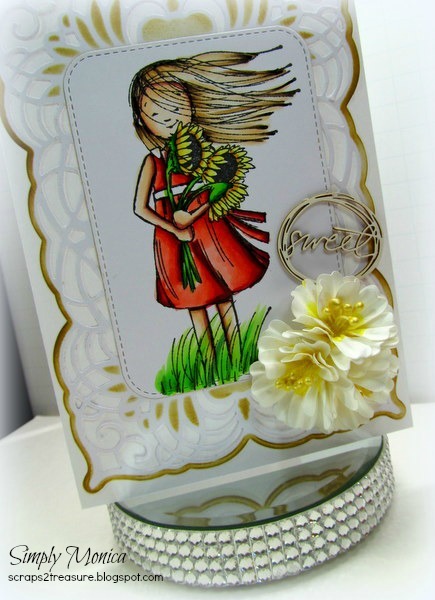 She's beautiful...love Unity's Phyllis Harris line of stamps! Beautiful! I have just started collecting Phyllis Harris stamps. They are wonderful. I still have to master my "reds" family of markers. You have done a fabulous job! I love everything about this card. The little girl is adorable and beautifully colored. The die you used is so delicate and is a perfect backdrop. Looking forward to the rest of your week. Sweet card and the frame really sets it off. Love this card, its beautiful!! So many details. aww she's so cute. and I love sunflowers. Phyllis Harris just makes my heart happy. I love how you designed around this one. It's beautiful. This is absolutely lovely! Your copies work is stunning, and I love the attention to detail you have the rest of the card as well. I love your card, it's so pretty!! The background goes so well with the stamp. Lovely card. Your coloring is so beautiful. Love this card and the stamp is one of my favorite Phyllis Harris stamps. What a super cute card! I'd love to get a card like that. Plus so much more personal when it is homemade!